For 20 years, McSweeney’s has been the first name (or last name, actually) in emerging short fiction. But this November, McSweeney’s will debut the first all-non-fiction issue of Timothy McSweeney’s Quarterly Concern: “The End of Trust” (Issue 54) is a collection of essays and interviews focusing on issues related to technology and privacy compiled with the help of the Electronic Frontier Foundation. In this era of constant low-level distrust—of our tech companies and our peers, of our justice system and our democracy—we can’t be sure who’s watching us, what they know, and how they’ll use it. Our personal data is at risk from doxxing, government tracking, Equifax hacks, and corporate data mining. We wade through unprecedented levels of disinformation and deception. Unsure of how our culture of surveillance is affecting the moral development of a generation coming of age online, we continue to opt in. 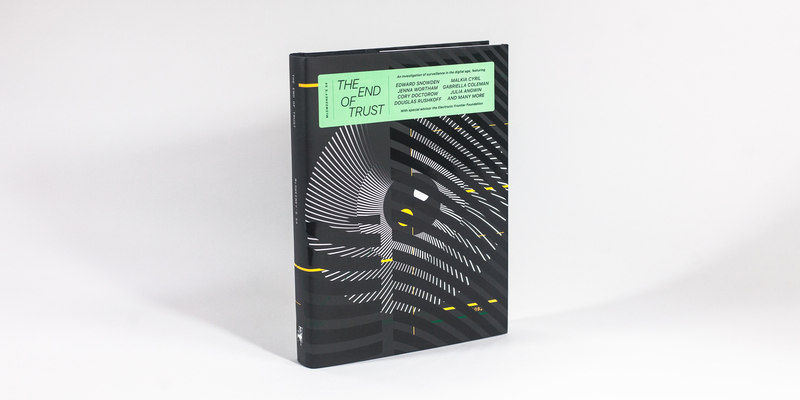 Across more than 350 pages of essays, debates, interviews, graphs, and manifestos from over thirty writers and with special advisor Electronic Frontier Foundation, this monumental collection asks whether we’ve reached the end of trust, and whether we even care. When McSweeney’s editors approached EFF earlier this year about the project, we jumped at the opportunity. The collection features writing by EFF’s team, including Executive Director Cindy Cohn, Education and Design Lead Soraya Okuda, Special Advisor Cory Doctorow, board member Bruce Schneier and myself, exploring issues related to surveillance, freedom of information, and encryption. You can preorder The End of Trust (McSweeney’s Issue 54) right now through McSweeney’s site. All images in this post are courtesy of McSweeney's and shareable under the Creative Commons Attribution-NonCommercial-NoDerivatives 4.0 International license.